This experience is depicted tangibly in the lines of this hat with slipped cables against a garter backdrop. Kindred can be knit in two colors to highlight the lines or in one color for a more subtle effect. Check out my Kindred Mitts pattern for a coordinating set. 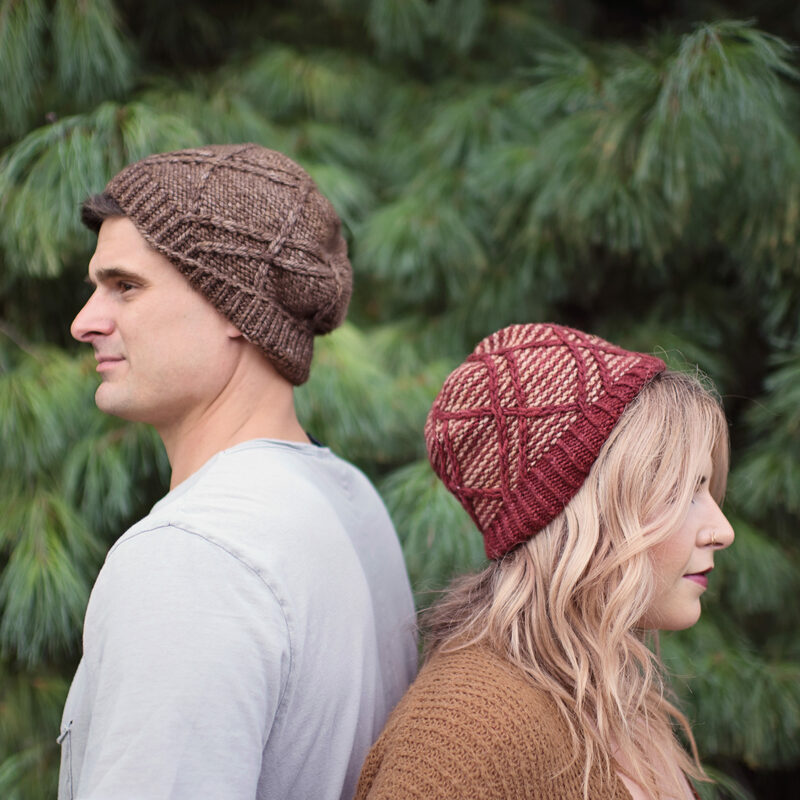 Purchase both the Kindred Hat & Mitts patterns and receive a $2 discount – no code needed and purchases do not have to be made at the same time. The discount will be automatically applied any time the second pattern in the set is purchased. YARN: In aran or chunky weight yarn you'll need 115 (130) yds / 105 (120) m.
Women's sample was knit with Malabrigo Twist (100% Baby Merino Wool; 150 yards/100g) in Burgundy (MC) and Applewood (CC). Men's sample was knit with Malabrigo Chunky (100% Merino Wool; 104 yards/100g) in Dark Earth. NEEDLES: dpns and 16” circular needles in size required to obtain gauge and two sizes smaller, cable needle. Recommended needle size for aran yarn is US 10 (5.75 mm) and US 8 (5 mm), and for chunky yarn US 9 (5.25 mm) and US 7 (4.5 mm).